"Where better to care for the soul than in the details of our daily lives?....The soul has an absolute, unforgiving need for regular excursions into enchantment. It requires them like the body needs food and the mind needs thought... An enchanted world is one that speaks to the soul, to the mysterious depths of the heart and imagination where we find value, love and union with the world around us. As mystics of many religions have taught, that sense of rapturous union can give a sense of fulfillment that makes life purposeful and vibrant." ~ Thomas Moore. 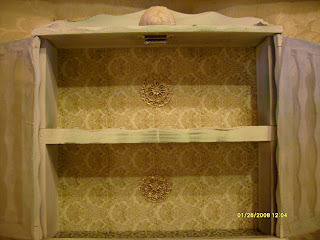 I just wanted to share the finished cabinet, a find from the Thrift Store for $3.17 using the change I had in my purse. 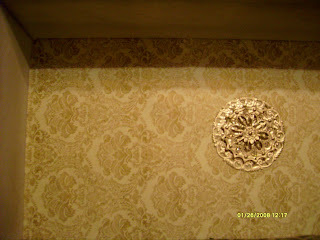 As I mentioned before, I am using things that I had already on hand, so there was no extra cost to embellish this. I do love it now. 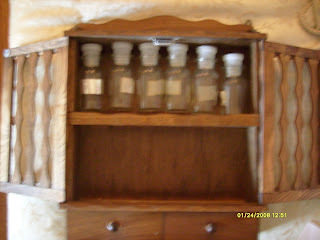 The bottles I will use for another purpose and project. 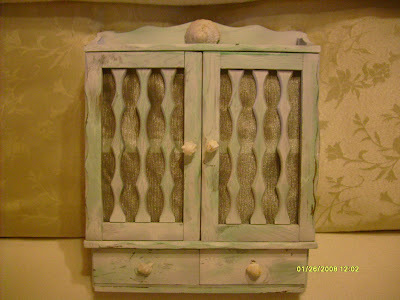 After, painting, distressing, and embellishing, inside, and out, front and back. 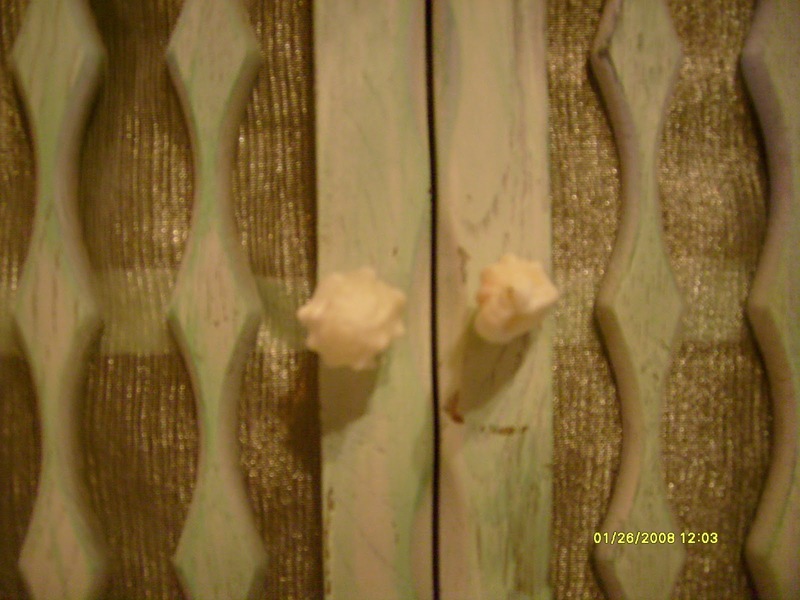 Sea shells are the door knobs and handles now and you can see the shimmering curtains. The drawer sea shell knobs. 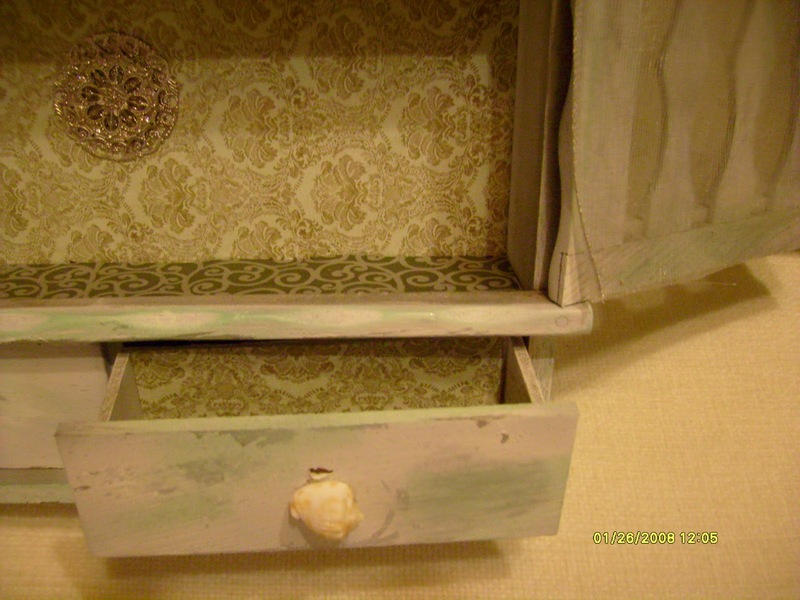 Even the drawers on the inside get papered. The back is not neglected. Detail of the ''wallpaper'' and ''wall medallion''. 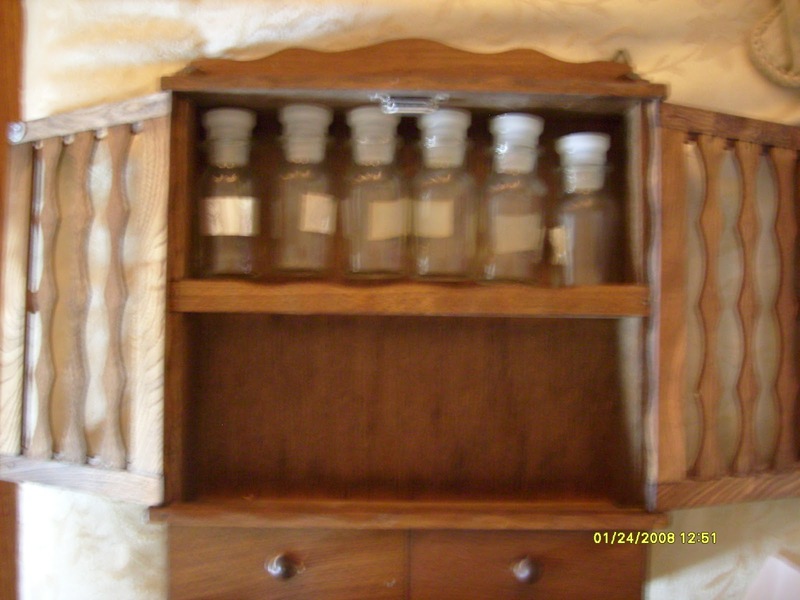 I found many creative ways to use this cabinet now. 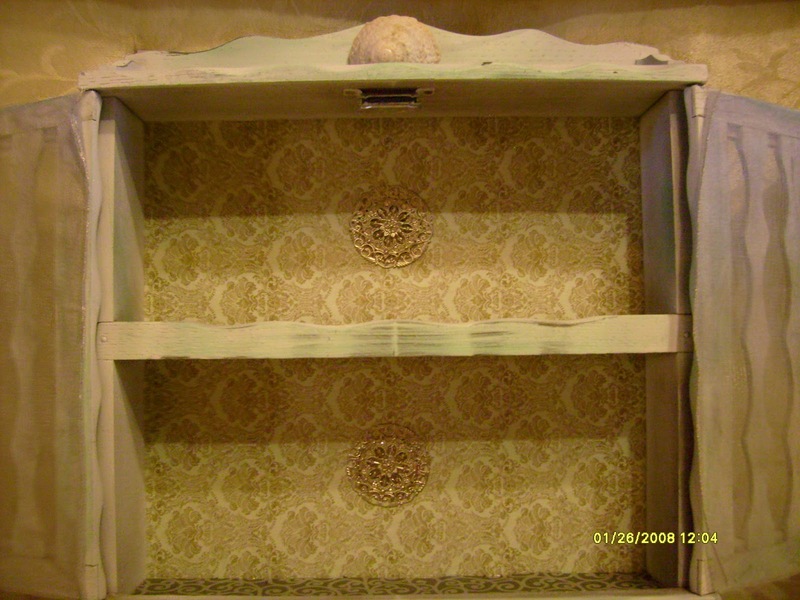 It is a very feminine display case, and can be used for example, to hold votive candle holders and floating candles. 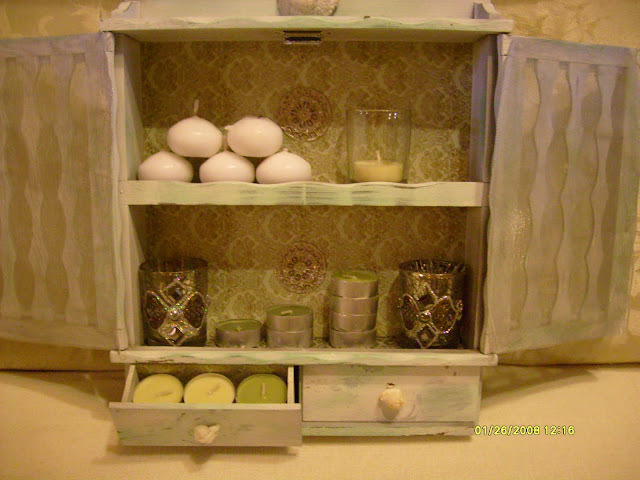 The drawers fit the tealights perfectly for storage. Or it can be used to display your crystal collections. It is quite beautiful ! 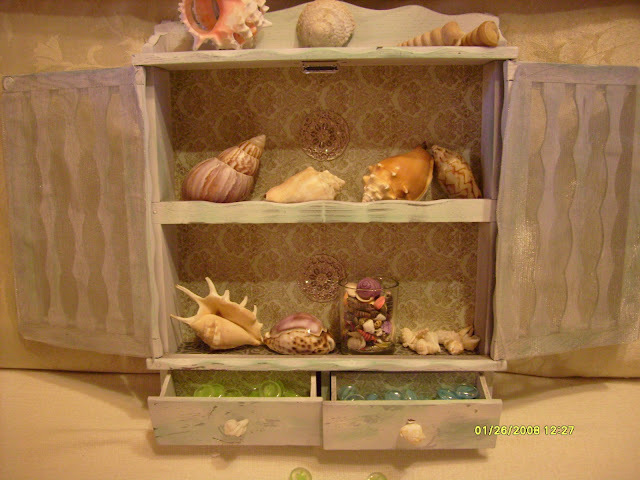 ........or even a seashell collection.....both large and tiny ones.....also quite beautiful ! with seaglass in the drawers! This is a very whimsical thing and for a young girl can spark her imagination to dream and become creative herself! 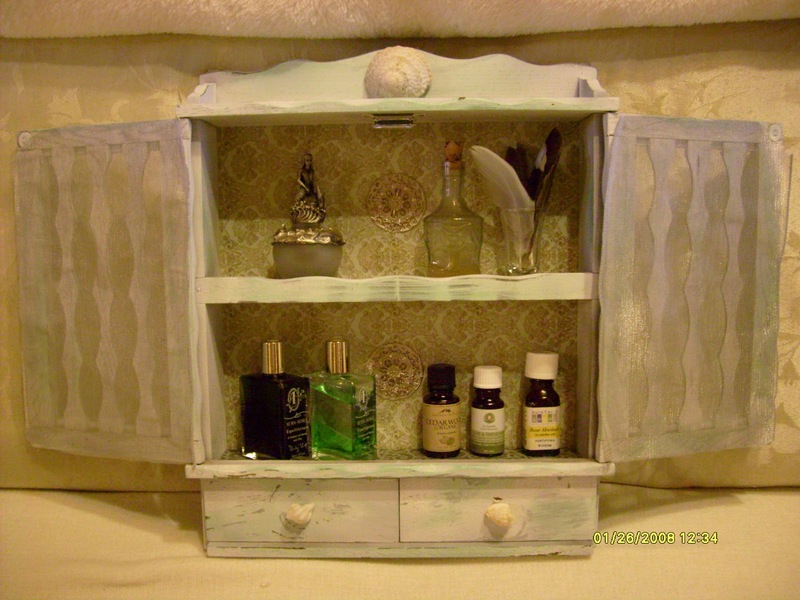 Or it can hold your perfumes, essential oils and pretty perfume bottles.....and maybe some collected feathers? This is a magical thing, and I can dream and imagine with this.....now, it is a good piece. I'm linking to Chic On A Shoestring Decorating for her Flaunt it Friday Party. Wow -- what a wonderful transformation! 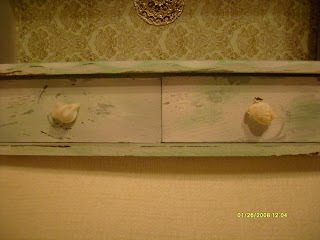 I especially like the shells for the knobs. 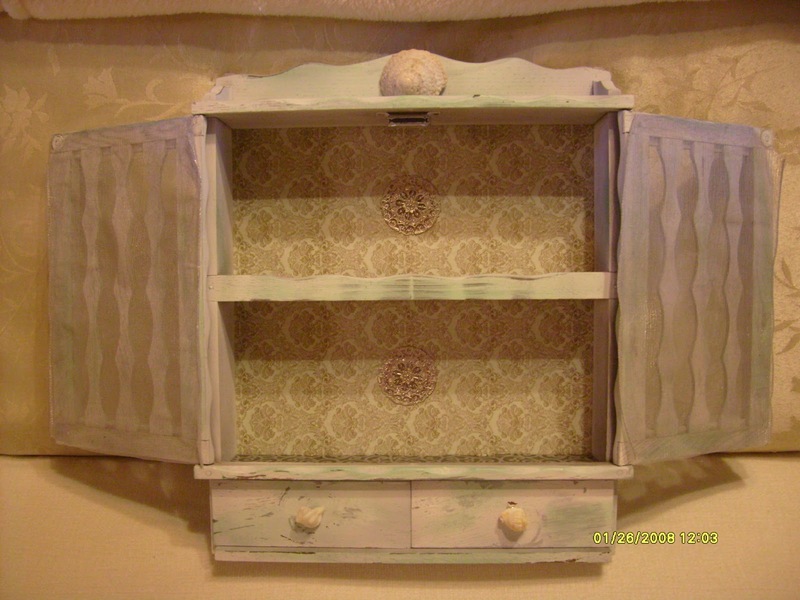 this turned out great, it looks like something in a fancy boutique...great job, i love it!! 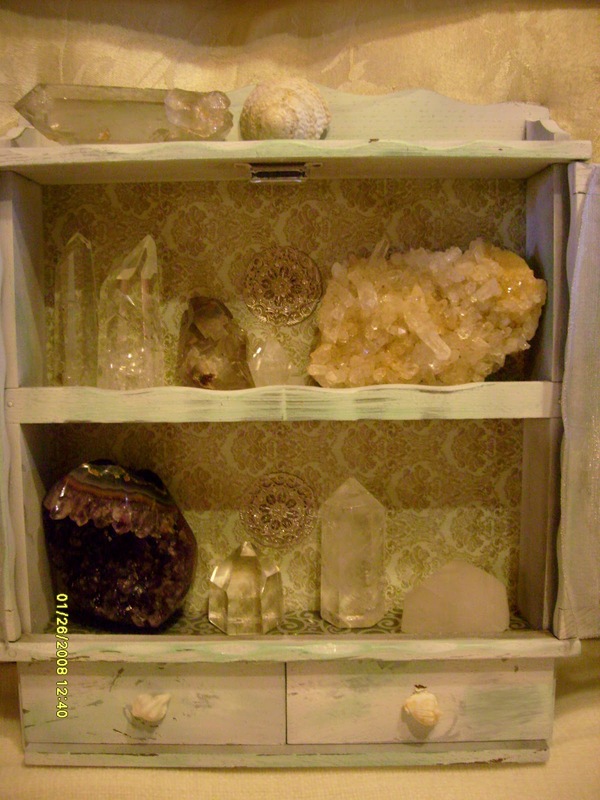 WOW, I love this and it looks so fabulous with each collection too!! What a wonderful creation and thank you SO much for linking it up to the party!!! Your thoughts and comments are always appreciated and responded to when possible. Find someone who loves the bones in your body and loves the skin that you live in. 'IN AWE OF MOTHER NATURE'' : Square Leaves ????? My First Piece "The Market Jacket"
All writings copywrited. 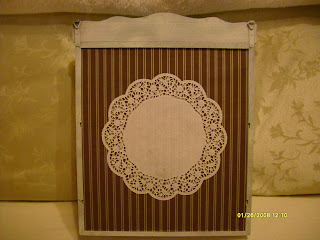 Permission is granted to share only in its entirety with name.. Picture Window theme. Theme images by A330Pilot. Powered by Blogger.